Don’t let these nasty plants ruin your fun outside. Poison ivy is best treated when it’s in a vigorous state of growth. We start scheduling eradication services on May 1st and start removal and treatments on May 15th. Contact our professional poison ivy removal service in Maryland and enjoy your outdoor time without worry. We service the entire state of Maryland! We do not simply destroy all the vegetation in and around the area, we strategically remove only the poison ivy or other noxious plants. We respect your property and your landscape, and we will take great care to not harm your flowers or other vegetation. Our gallery of before and after pictures and plant identifications will better assist you in identifying the plant. They will show you typical areas poison ivy grows as well. Please submit your request below. Thank you. As a leading poison ivy control service in Maryland, we are dedicated to giving you the very best in noxious plant removal & control. Our service is second to none when it comes to taking a personal interest in your unique situation. We offer a service that is unique and economical and is worth the effort. Call today and and set an appointment, you’ll be glad you did. We provide service for many different situations such as single family residences, estates, city parks, forested areas, HOA’s and much more. We have helped thousands of people live poison ivy free lives and saved them from a lot of itch, pain, and discomfort. From removing poison ivy, oak, sumac and vines, we do it all. Let our experienced and professional technicians solve your problem today. Jim Schaefer interviews Larry Atkins about what it's like to do a job others just won't do. Poison ivy can grow as a ground cover, a low shrub, or a climbing vine. Forget waxy or shiny leaves, forget red stems, poison ivy may or may not have these characteristics and many other plants may have them. 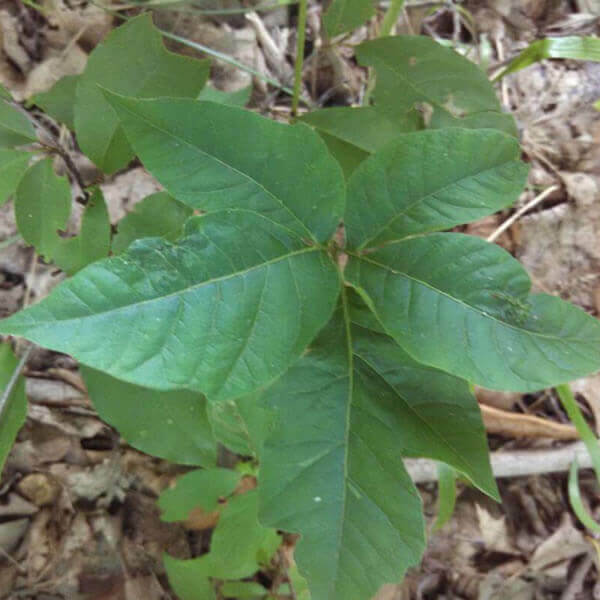 The best way to identify poison ivy is to know that there is an inconsistency in the notches on the 3 leaves. They are usually not mirror images of each other, there are subtle differences that vary from leaf to leaf, cluster to cluster, on the same plant. Take some time and browse through our Poison Ivy gallery page to see images of poison ivy and some before and after pictures. If you think you have a problem, please contact us to schedule a consultation. The stem has a larger leaf at the end, and two smaller leaves shooting off the sides. The leaves have pointed tips. The plant is reddish in the spring, green in summer, and yellow/orange in the fall. These are just a few identification tips.